We’d love your help. Let us know what’s wrong with this preview of Guess Who by Chris McGeorge. To ask other readers questions about Guess Who, please sign up. Chris McGeorge's debut psychological thriller drops the reader into the locked room syndrome with six people amidst whom walks a killer, and a corpse in the bathroom. Morgan Sheppard is a notoriously famous TV resident detective, in a show of a similiar ilk to the ghastly Jeremy Kyle Show, who decides who is telling the truth amongst characters accused of being cheats and more. This is a gig he acquired on the back of his history as a child, when at the tender age of 11 years old, he solved the Chris McGeorge's debut psychological thriller drops the reader into the locked room syndrome with six people amidst whom walks a killer, and a corpse in the bathroom. Morgan Sheppard is a notoriously famous TV resident detective, in a show of a similiar ilk to the ghastly Jeremy Kyle Show, who decides who is telling the truth amongst characters accused of being cheats and more. This is a gig he acquired on the back of his history as a child, when at the tender age of 11 years old, he solved the murder of Mr Jeffries, his Maths teacher at his school, assumed to have hanged himself. His reputation as a young Sherlock Holmes and the TV show have made him wealthy, any qualms about his role are held at bay by his addictions to drink and drugs. He wakes up one day handcuffed to a bed with five other strangers in a hotel room in central London, none of them have any idea how they come to be there or why. A man in a horse's head mask assigns the task of discovering who killed the man in the bathroom to Sheppard in three hours, and if he fails, everyone in the hotel will be killed in a series of explosions. Sheppard feels a clawing need for drink and drugs, but he has to find the resources to function without them as time presses him to try and identify the murderer amongst his motley collection of companions. The victim, to Sheppard's horror, is well known to him, it is Simon Winter, a psychologist who served as his therapist for numerous years since he was 11 years old. It turns out everyone else knows him or has a connection to him too. From the start Sheppard can feel in his bones that this entire scenario is about him, but his addled brain struggles to penetrate the dense fog of his memories, where it is difficult to discern what is fact and what is fiction in his carefully constructed personal history. Events spiral out of control amidst the occupants of the hotel room as mayhem and suspicion run rampant. Who is behind their predicament and what is their motive? Wow.. Guess Who is an interesting ride! Let's meet Sheppard.. he's a famous true crime detective who wakes up handcuffed to a bed in a hotel room. Sheppard is not alone in this hotel room... he is accompanied by Mandy, Alan, Constance, Ryan, and another nameless girl wearing headphones. Just to add one more thing to a mix... a dead body is laying in the bathroom. A mysterious horse-masked man appears on the television in the hotel room. He gives Sheppar Wow.. Guess Who is an interesting ride! A mysterious horse-masked man appears on the television in the hotel room. He gives Sheppard three hours to find out who killed the body in the bathroom. If he fails, the hotel will be destroyed. The novel alternates between present and the immediate past. Sheppard has struggled with alcohol and drug addiction in the past... which complicates things in him solving the crime. Kuddos to the author for being creative! I was very intrigued by the premise of the storyline but unfortunately the story fell flat for me after the opening bang of a scene. This is an extremely slow burn of a thriller. Also, was a tad bit over the top with some of the characters and unbelievable. I did really enjoy how the author connected Sheppard's flashbacks to the overall story. Overall, 3 stars for me on this one. Thank you so much to Harlequin/Hanover Press for the opportunity to read this arc in exchange for my honest thoughts. So here’s the thing – I love locked-room mysteries. It takes your typical mystery, turns it into a microcosm and increases the mistrust and paranoia by 100%. You can either have something that feels like real life with a narrow focus. Or you can have something that is wild and kind of ridiculous that feels removed from real life. Both of these approaches up the “fun” element of a typical mystery and it’s why I like this sub-genre so much. The problem with Guess Who is that it tries to be both. Like I said at the top, the first half of the book was leading me to a soft five-star rating. It was wild and crazy and totally removed from real life. Although I could have done without that goddamn horse mask. Ridiculous does not need to equal silly. The second half of the book tried too hard to ground the novel in reality. The flashback chapters to Morgan as a child and the murder of his math teacher felt quiet, dragging down the pace and the emotions that were amped up previously. Sometimes I was a little bored even. The identity of The Evil Man was clear after this, but still, we had to wait for Sheppard to figure it out and it started to feel like he wasn’t just a bad detective, but also kind of stupid. And really, that was just a fault of the plotting and not necessarily of the characterization. Then you get to the part where all the fantastical elements of how The Evil Man pulled off what he pulled off are revealed. And this again, tried way too hard to make things seem plausible or logical, instead of playing up the ridiculous, flashy aspects. Explanations were offered up that were long and required so much dialogue that it started to feel like a silly cartoon villain dropping into a monologue where he explains his own genius to his captive prey. Explaining for five paragraphs how you, as a villain, managed to make so much money so that you could afford your grandiose evil plan, takes the fun out of it. A simple, “The stocks are boring when you are so good at them,” would have been enough. Explaining how you managed to do what you did with the hotel room and how you got all these people there, doesn’t make it more impressive it makes it less believable. Again, ridiculous to silly. I don’t need to know all the details because it dispels the magic that exists on its own in within that sinister mystery. If less time had been given to explaining how this was pulled off, and more time spent on the emotional reasons why someone would be driven to mastermind such an event, I would have found the second half of the book much more satisfying. But as it was, the author tried so hard to ground this ridiculous, exaggerated plot – that would literally never happen in real life – into reality, that instead of keeping up that wild tone, it ended up taking itself too seriously. Even still, it was a good read. Not great, even though it could have been, but good. The plot is complex, though the Evil Man is knowable a little earlier than I think the author might have intended. The characters don’t have much depth, but they are uniquely drawn and therefore you get a pretty good idea of who they are, just enough to extend the mystery of the killer for the reader. I liked the main character of Morgan Sheppard. The contrast of the real him – a self-hating liar who is going through withdrawal from addiction in this dire situation – against the idea of who he is – some successful, smart TV star – added a new layer to the novel outside of the complex plot. And though he isn’t likable, there is something human about Sheppard that makes his quest for redemption engaging and hopeful. Overall, this is rough around the edges, but for a first novel it’s a good effort and I wouldn’t hesitate to pick up McGeorge’s next novel. 3.5 stars rounded down. Guess Who is an intelligent, immersive whodunnit – most excellent plotting allows you to solve the mystery if you are paying attention but distracts you with things like blood and hysterics and general mayhem. The personalities are all cleverly obfuscated, my advice is trust no-one and Mulder doesn’t even put in an appearance. It is a twisted tale, an old fashioned locked room mystery given a modern and fresh feel – pacy and wonderfully written, a multi-faceted character drama with added murder. We have a hero and a villain for sure but it’s the shades of grey that mean you could consider which way round they sit. Racing along to an edgy and possibly unexpected conclusion (unless of course you do follow the clues and Guess Who) this was a genuinely engaging and entertaining read. When Morgan Sheppard wakes up, he finds that he is handcuffed to a bed in a hotel room he's never seen before. All around him are bodies ... 5 of them to be exact ... all living, but just as confused as he is. There is a dead body in the tub in the bathroom. One of the people in that room is a killer and he has exactly 3 hours to figure out who the killer is. If he doesn't find the killer, they will all die. So begins a take on the locked room mysteries of old. This is a well-written complex story When Morgan Sheppard wakes up, he finds that he is handcuffed to a bed in a hotel room he's never seen before. All around him are bodies ... 5 of them to be exact ... all living, but just as confused as he is. There is a dead body in the tub in the bathroom. One of the people in that room is a killer and he has exactly 3 hours to figure out who the killer is. If he doesn't find the killer, they will all die. This is a well-written complex story full of twists and turns. The rapid pacing and energetic action kept me glued to the pages from beginning to surprising ending. The characters are indelibly drawn with a lot of attention paid to each and every one. It's hard to imagine that this is a debut novel. I've always loved puzzles ... this was the best ever. Many thanks to the author / Hanover Square Press / Netgalley for the digital copy of this crime fiction. Opinions expressed here are unbiased and entirely my own. A group of strangers awakens in a locked hotel room, and soon discovers a dead body in the room with them. To escape the room, they are tasked with identifying the killer, who is one of them. The main character, Morgan Sheppard, hosts a detective show on television. He is the primary target of the madman who has kidnapped them and locked them in a room with a corpse. The kidnapper appears on the room’s TV to address the strangers, and tells Shappard that to prove he is a good detective, he needs A group of strangers awakens in a locked hotel room, and soon discovers a dead body in the room with them. To escape the room, they are tasked with identifying the killer, who is one of them. The main character, Morgan Sheppard, hosts a detective show on television. He is the primary target of the madman who has kidnapped them and locked them in a room with a corpse. The kidnapper appears on the room’s TV to address the strangers, and tells Shappard that to prove he is a good detective, he needs to solve the mystery. Since the punishment of not solving the mystery in the allotted time is death, the others are, obviously, trying to identify the killer too. Lots of drama, distrust, and arguments. Throughout the novel, flashbacks of Sheppard’s childhood appear. When he was young, Sheppard solved a mystery, and that case brought him a lot of attention and fame. Ever since then, he has struggled with desiring the attention that fame affords, but also battling with personal demons. 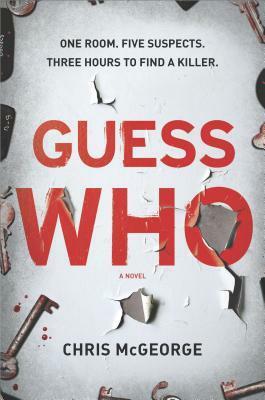 Saw meets Agatha Christie, in Chris McGeorge's debut tale Guess Who . Morgan Sheppard is a famous television detective, made notorious after figuring out a murder when he was a child. Flash-forward to the present day, Morgan is now living the life of an A-list celebrity in the UK. His television career has become more sensationalized as time progressed—think Maury, but probably classier. Morgan has wealth and he has fame, but consequently, that also creates enemies and rivalries. Morgan wakes u Saw meets Agatha Christie, in Chris McGeorge's debut tale Guess Who . Morgan Sheppard is a famous television detective, made notorious after figuring out a murder when he was a child. Flash-forward to the present day, Morgan is now living the life of an A-list celebrity in the UK. His television career has become more sensationalized as time progressed—think Maury, but probably classier. Morgan has wealth and he has fame, but consequently, that also creates enemies and rivalries. Morgan wakes up one morning handcuffed in a hotel room, unsure on how he ended up in this predicament. Morgan soon realizes that he's not alone in this room—there are five others also captured, and a dead body in the bathroom. It becomes clear that there's something clearly wrong with this picture, but nobody can determine why. When all clues lead to the theory of a murderer being trapped alongside with the group, Morgan must try his best to figure out the case, or else everybody is in danger. Guess Who is a tough book to review for a variety of reasons. It's a fun story to dive into. It's a classic case of Clue, or Hercule Poirot's Murder on the Orient Express, and spun with a modern-day tone. Guess Who is a whodunnit at it's core, but it's also a pretty interesting mystery—no matter how light-heartedly it was written. While it was a slow-burning plot, it did have some clever clues and twists along the way. I was mildly disappointed in the style in which the mystery was developed, but overall I do think this book will be an entertaining, or at least a fun read for most mystery seekers. I think I'll keep Chris McGeorge on the radar for future works, and will recommend this to readers who want to read classic whodunnit's with an edge. The story opens up with local celebrity Morgan Sheppard waking handcuffed to a bed in a hotel room with five people he does not know. All five of the people in the room have no idea how they have gotten there, or so they say. One of them must because they are a killer. There is a dead body in the bathtub and someone knows how it got there. It is up to Sheppard to find out who. Or they all die. How is that for an opening? Absolutely intriguing right? It drew me right into the story. Unfortunately The story opens up with local celebrity Morgan Sheppard waking handcuffed to a bed in a hotel room with five people he does not know. All five of the people in the room have no idea how they have gotten there, or so they say. One of them must because they are a killer. There is a dead body in the bathtub and someone knows how it got there. It is up to Sheppard to find out who. Or they all die. How is that for an opening? Absolutely intriguing right? It drew me right into the story. Unfortunately it fell into a lull for me and I had trouble getting into the book after the initial chapters. The author would flip to the past to fill in the gaps, which I actually found really interesting. It was the present day trying to find out who did it that I had trouble with. With that said it was so unique and crazy to wrap your head around what was going on. Not sure why this was not a 5 star for me, because it is a unique and clever tale but I found it a bit far fetched and I had trouble with that. Don't let that deter you, because a lot of people will love this book. I almost feel like if you like sci fi you would love this. It is not sci fi, but you need to be able to have an open mind and be a bit creative in your thinking and I am sure you will love it. Just not my personal go to book but I am so glad I read it. Whoever is writing the synopses for his books should get a raise! I'm serious I had to read this book like immediately after reading that synopsis. I was a little scared though that it wouldn't live up to the high expectations I acquired after reading it but it got pretty damn close. Definitely not a bad start for a debut! My only complaint really is that all of the characters were so unlikable I didn't really have anyone to root for. If they all died in that room it really wouldn't have made on Whoever is writing the synopses for his books should get a raise! I'm serious I had to read this book like immediately after reading that synopsis. I was a little scared though that it wouldn't live up to the high expectations I acquired after reading it but it got pretty damn close. Definitely not a bad start for a debut! My only complaint really is that all of the characters were so unlikable I didn't really have anyone to root for. If they all died in that room it really wouldn't have made one difference to me and definitely no loss to humanity. The plot and the mystery is what stood out to me and what makes this a good book. Once I started reading I was hooked until the final page. A Propos Blut… ein Wort zum Cover: genial, oder? Meine kleine Tochter hat tatsächlich kurz aufgeschrien, weil sie dachte, an dem Buch klebt echt Blut! Kompliment an die Cover-Designer. Escape Room ist ein Buch, das schon seit September ungeduldig auf meinem Lesestapel auf seinen Einsatz wartet. Ich bin damals sofort darauf angesprungen, weil ich ja so unheimlich gerne EXIT-Spiele spiele.. Guess Who has an interesting premise, that has been positioned by others as 'Agatha Christie meets Saw', so I was immediately excited. I loved the concept that strangers wake up in a hotel room together with a dead body and have a limited amount of time to figure out 'whodunnit' before disaster strikes. Unfortunately for me, that's where my enjoyment of the book ended. While the overall plot was intriguing, I had a hard time with the execution. I never connected with any of the characters, in fa Guess Who has an interesting premise, that has been positioned by others as 'Agatha Christie meets Saw', so I was immediately excited. I loved the concept that strangers wake up in a hotel room together with a dead body and have a limited amount of time to figure out 'whodunnit' before disaster strikes. Unfortunately for me, that's where my enjoyment of the book ended. While the overall plot was intriguing, I had a hard time with the execution. I never connected with any of the characters, in fact, I disliked every single one of them, which made it hard for me to root for them in the long run. When the reveals happened in the book, I wasn't excited about them like I wanted to be, and I found myself wishing the book would move forward faster. It felt like it was too long for the story. Overall, the book just didn't work for me. It felt unrealistic, slow, and it didn't feel like anything new (which isn't always necessary, but it just felt like this had "been there, done that" and in a better way in other books and movies.) If you're a fan of very slow moving mysteries and unlikeable characters, this may be better suited for you. I was in the mood for a light-hearted puzzle mystery book and this recently published “locked room” mystery seemed to fit the bill. A TV host detective with secrets in his past wakes up handcuffed in a hotel room and tasked with figuring out which of the five other kidnapped people in the room murdered the corpse in the bathroom. If he doesn’t solve the murder in three hours, his mysterious captor seen only on a TV screen threatens to blow up the whole building. I read the book all in one day an I was in the mood for a light-hearted puzzle mystery book and this recently published “locked room” mystery seemed to fit the bill. A TV host detective with secrets in his past wakes up handcuffed in a hotel room and tasked with figuring out which of the five other kidnapped people in the room murdered the corpse in the bathroom. If he doesn’t solve the murder in three hours, his mysterious captor seen only on a TV screen threatens to blow up the whole building. I read the book all in one day and found myself skimming some parts because those parts seemed to be slowing down the action. The book flashes back and forth between different points in time and there is a reveal at the end that tells you in detail about how everything was set up. I should have picked up on more of the clues along the way. If you are a cozy mystery lover, this book is probably too dark for you, but I think there is a specific audience that would really like it. At the age of eleven, Morgan Sheppard solved a homicide and has been riding the subsequent wave of Boy Wonder fame ever since. Decades later, a masked man challenges Sheppard’s detective skills. He wakes up sealed in a hotel room with five strangers. There’s a dead body in the bathtub, and Sheppard is given three hours to figure out who did it. If he fails, there will be dire consequences. This Saw-like premise is enticing enough to ensure you’ll read to the end. We must unlock the secrets of thi At the age of eleven, Morgan Sheppard solved a homicide and has been riding the subsequent wave of Boy Wonder fame ever since. Decades later, a masked man challenges Sheppard’s detective skills. He wakes up sealed in a hotel room with five strangers. There’s a dead body in the bathtub, and Sheppard is given three hours to figure out who did it. If he fails, there will be dire consequences. This Saw-like premise is enticing enough to ensure you’ll read to the end. We must unlock the secrets of this hotel room! However, the journey isn’t as thrilling as it might seem. Sheppard is a thoroughly unlikable narrator. I’m not just being snotty. He doesn’t even like himself. I wasn’t invested in his survival, and sometimes I even found myself actively rooting against him. As the plot progresses, the other characters also prove to be either detestable, one dimensional, or simply unbelievable. Only one hotel “guest” tugged at my heart strings. (Guess who!) I wish this particular character had been more prominent because I needed someone worthy of my faith and attachment. The short chapters keep you moving quickly through the book. I LOVE hating on characters and I absolutely hated on Shep So here's the thing. I was in it to win it with this book. Had me captured from the first page.. and then about 3/4 of the way in… I was like waiiiit a minuuuteee… is this like SAW but NOT? And luckily it didn't go quite in the direction that I thought it would but it did veer in a completely different direction that I didn't expect (serious kudos for that) but also like WHAT?! Ultimately, I thoroughly did enjoy this book. I really, truly did. However, the ending was a little bit off-putting to me. I would've preferred it had it gone <---- no spoilers here, folks but maybe that's just a me thing... regardless, this is a fast paced and entertaining read. I just wanted... a little... bit... more. Thank you Hanover Square Press for this copy! But the game is not." Wow. Wild ride does not do this justice! Guess Who is reminiscent of the famed Agatha Christie's And Then There Were None with an intensity of a thriller on steroids! And trust me, you will be trying to guess who all the way to the end! Morgan Sheppard, a TV detective, wakes up handcuffed to a pole, in a locked hotel room with 5 strangers and 1 dead body. If that isn't bad enough, up pops the TV screen with an unknown, masked messenger informing Sheppard he has 3 short hours to solve this mystery or there will be horrific consequences to be paid. If that doesn't grab you, I don't know what will! Guess Who is told from the point of view of Morgan Sheppard in present time with bits of memories of his past poking through to give us a better picture of who he is and why he is. He isn't the most cuddly, lovable protagonist but that is what molds him into the perfect one. Guess Who has all of the intriguing, creepy ingredients that makes it an outstanding psychological thriller! Special thanks to Netgalley and Harlequin Publishing for an advanced reader copy of Guess Who. "Escape Room" ist eine Mischung aus Cluedo und Escape Room, wie der Name schon sagt. Man hat sechs Leute, die in einem Hotelzimmer aufwachen, eine Leiche und den "Gamemaster", der immer mal zu ihnen spricht. Die Aufgabe: eine der Personen, der abgehalfterte TV-Star Morgan Sheppard, muss den Mord aufklären und einen der Mitgefangenen als Mörder benennen. Wenn er das nicht schafft, werden alle nach drei Stunden sterben. Kūrinio idėja gera, bet toks jausmas, kad su jos atlikimu kažkaip... persistengta. Gerai, kad uždaryti kambaryje ir priversti spręsti nusikaltimą žmonės nežino, ką toliau darys juos uždaręs pamišėlis, bet nauji dalykai, kuriuos sužinome, atrodo toks overkill, kad tiesiog nelogiška (žinau, žinau, pAmIiIišĖėĖlis - na, bet vis tiek). Pavyzdžiui, (labai dideli spoileriai!!!) (view spoiler)[Jie galvoja, kad yra viešbučio kambaryje, bet iš tiesų yra rūsyje po žeme, kuris padarytas panašus į viešbučio Kūrinio idėja gera, bet toks jausmas, kad su jos atlikimu kažkaip... persistengta. Pavyzdžiui, (labai dideli spoileriai!!!) (view spoiler)[Jie galvoja, kad yra viešbučio kambaryje, bet iš tiesų yra rūsyje po žeme, kuris padarytas panašus į viešbučio kambarį. Vienas pagrobtasis yra viešbučio darbuotojas, jis buvo įtrauktas tik todėl, kad sustiprintų įspūdį, jog čia yra viešbutis? Ok? O kodėl reikėjo viešbučio? Pasirodo, dėl to, kad vaikystėje vienas iš veikėjų kažką pasakė apie tą viešbutį kitam veikėjui, ir dabar anas keršija uždarydamas jį viešbutyje, kurį jis minėjo, bet iš tikrųjų... visai ne viešbutyje...? Kodėl tada iš tikrųjų neuždarė viešbutyje? Nežinau, atrodo kažkoks milžiniškas pritempimas. Kažkuo priminė John Katzenbach "Analitikas", niekuo nepriminė "užrakinto kambario" detektyvo, nors jie ir yra užrakintame kambaryje. I did not enjoy this book. I felt it was too derivative - specifically of the movie, Saw. And the dual timeline fell apart toward the end, making the story feel disjointed and, at one point, like you had entered a different (almost better) story altogether. I felt like I labored through the second half of the book - already knowing who the perpetrators were and just waiting for the MC to realize it. Turns out, surprise! I was right and the denouement was no surprise, but more than that - it wasn' I did not enjoy this book. I felt it was too derivative - specifically of the movie, Saw. And the dual timeline fell apart toward the end, making the story feel disjointed and, at one point, like you had entered a different (almost better) story altogether. I felt like I labored through the second half of the book - already knowing who the perpetrators were and just waiting for the MC to realize it. Turns out, surprise! I was right and the denouement was no surprise, but more than that - it wasn't even interesting getting there. I hope I have the unpopular opinion here, but I really didn't like it and I feel like I wasted my time. Guess Who is a title that I have had for months, but just recently decided to read. I love playing detective when reading murder mystery novels and I saw that this one was classified as a whodunit mystery, meaning one that the reader can figure out. While reading I tried really hard to figure the mystery out, but I didn’t guess correctly. Guess Who reminded me of the Saw movies. A celebrity detective, Morgan Sheppard, and 5 other people were locked in a hotel room with a dead body and Morgan Sheppard was given three hours to figure out who the murderer was. As clues were uncovered and ties to the victim were questioned I found myself more and more captivated with this story. This is a fabulous debut for Chris McGeorge. The characters were pretty interesting. Morgan Sheppard was a very morally grey character, which I love to read about. He had a love of fame and didn’t really care who he stepped on to get it. He was extremely flawed and a well written character, even if I found myself not liking him all the time, I did relate to him because he was so imperfect, so human. The story also included flashbacks to his past, which really helped with character development and a few clues to the mystery as well. The plot was really riveting. I loved the way everything was laid out and I played detective while reading, highlighting and taking notes on parts that I thought could be clues. I actually wound up highlighting a big clue that I didn’t see for everything that it was. I was so disappointed that I didn’t solve it once I realized that the answer was right under my nose. Guess Who was a lot of fun to read and try to solve. I haven’t read a ton of whodunit mysteries, as I have focused more on psychological thrillers and cozy mysteries lately, but with this introduction to the genre I would love to explore it further in the future. Five people,one hotel room,a dead body in the bathroom and only three hours for Morgan Sheppard to figure out who the killer is amongst them or they are all going to die.That's the simple premise to this intricately plotted tale of deception,secrets,manipulation and revenge.It has more twists and turns and grips the reader just as tightly as the largest,fastest roller coaster.I admit you do have to suspend your imagination at times whilst reading it but hey,it's a fictional story.You want things Five people,one hotel room,a dead body in the bathroom and only three hours for Morgan Sheppard to figure out who the killer is amongst them or they are all going to die.That's the simple premise to this intricately plotted tale of deception,secrets,manipulation and revenge.It has more twists and turns and grips the reader just as tightly as the largest,fastest roller coaster.I admit you do have to suspend your imagination at times whilst reading it but hey,it's a fictional story.You want things to be realistic and true to life,go and read a autobiography or something non fictional instead. The main protagonist of this tale is Morgan Sheppard,alcoholic, drug addict and star presenter of a morning tv show that is a bit like Jeremy Kyle`s show.He`s upset many people over the years but what has he done that would cause someone to go to such extreme lengths to punish him and why does their tormentor insist that Sheppard must be the one who figures out who the killer is? Throughout the story we learn about Sheppard`s life both as a adult and also back in 1992 - 93 when he was a young boy.Out all the characters Sheppard`s is the most fleshed out but the reader is given enough background information about the secondary characters that they felt just as vivid and realistic as Sheppard did. I liked three out of the five other characters who where trapped in the hotel room with Sheppard despite knowing how untrustworthy they were.I felt a bit of sympathy towards the killer once the motivations behind their actions were revealed . Although I enjoyed both parts of the story,my absolute favourite parts where the chapters set in the claustrophobic,highly charged,tension filled hotel room.These parts where so intense,packed with twists,double crosses,mistrust,intrigue and suspense. My Review: Guess Who is a brilliant page turner which kept me guessing and I didn’t work it out until the actual reveal. A simple yet brilliantly plotted story about Morgan Sheppard a TV detective famous for his morning TV show “Resident Detective” who wakes up handcuffed to a bed in a hotel room with five strangers and one dead body. Sheppard has three hours to work out who the murderer is before they all die, however all the suspects are somehow connected to the victim especially Sheppard who is My Review: Guess Who is a brilliant page turner which kept me guessing and I didn’t work it out until the actual reveal. Sheppard has three hours to work out who the murderer is before they all die, however all the suspects are somehow connected to the victim especially Sheppard who is struggling to deal with reality without his alcohol and pills and an overwhelming guilt of his connection to the dead body. The author skilfully takes the reader back to Sheppard’s past in little snippets throughout the story which help unravel the truth or does it? Met dank aan Luitingh-Sijthoff voor het vooruitexemplaar. Een gesloten kamer, een lijk, vijf verdachten en drie uur om de moordenaar te vinden staat er op de achterflap. Kortom alle ingrediënten voor een spannende thriller. Chris McGeorge begon deze thriller voor zijn scriptie voor zijn master creatief schrijven. De titel die hij bedacht had was oorspronkelijk Deadroom en het werd Guess Who. De Nederlandse titel, Tik Tak. Morgan Sheppard heeft als 11-jarige de moord op zijn wiskundeleraar opgelost te Met dank aan Luitingh-Sijthoff voor het vooruitexemplaar. Morgan Sheppard heeft als 11-jarige de moord op zijn wiskundeleraar opgelost terwijl iedereen dacht dat het zelfmoord was. Vijfentwintig jaar later is hij een succesvol en beroemd presentator. Vrouwen, drugs en drank beheersen zijn leven. Op een dag wordt hij wakker in een afgesloten hotelkamer , geboeid en met vijf vreemden in de kamer die ook net ontwaken. In de badkamer ligt een lijk. Dan verschijnt er een man op de tv met een masker voor, die hem de opdracht geeft om de moordenaar van het lijk in de badkamer te vinden onder de aanwezigen in de kamer. Hij heeft drie uur de tijd om de moord op te lossen, lukt het hem niet dan zal iedereen sterven. De race tegen de klok begint. Een origineel concept heeft de auteur bedacht. Het grootste gedeelte van het boek gaat over een hotelkamer met mensen maar het blijft spannend van het begin tot het eind. Een knappe prestatie vind ik van de auteur om dat voor elkaar te krijgen. Je blijft geboeid en gaat zelfs mee puzzelen. Door flashbacks kom je meer over Morgan te weten en wat de mensen in de hotelkamer met Morgan gemeen hebben. Een enorme plotwending die je niet ziet aankomen maar het was alleen jammer dat die voor mij te snel kwam want nu werd het duidelijk wie er achter het masker zat. Ik had ook inmiddels al een idee wie de dader kon zijn maar je blijft toch met plezier verder lezen tot het einde. Tik Tak van Chris Mc George is vanaf 29 mei verkrijgbaar en wat mij betreft dus een aanrader. I would like to thank Netgalley and Orion Publishing Group for an advance copy of Guess Who, a stand alone thriller set in a hotel room, somewhere in London. Television presenter Morgan Sheppard wakes up handcuffed to a pole in a hotel room in London. As he gradually comes to he realises there are 5 other people in the room with him and a dead body in the bath. Then the television comes alive and and a man in a horse's head mask tells Sheppard he has 3 hours to find the murderer or the entire hot I would like to thank Netgalley and Orion Publishing Group for an advance copy of Guess Who, a stand alone thriller set in a hotel room, somewhere in London. Television presenter Morgan Sheppard wakes up handcuffed to a pole in a hotel room in London. As he gradually comes to he realises there are 5 other people in the room with him and a dead body in the bath. Then the television comes alive and and a man in a horse's head mask tells Sheppard he has 3 hours to find the murderer or the entire hotel will be blown up. I enjoyed Guess Who which is a good thriller with twist upon twist and, rather obviously, its origins in Sheppard's past. It is a modern twist on the locked room formula where there is a limited number of suspects. Much of the novel hinges on Sheppard and it is told from his point of view. As he is a fairly unpleasant character with drug and alcohol dependencies it soured the read a bit for me and I didn't feel as involved in the novel as I would have with a more likeable protagonist. However, having said this, the novel wouldn't exist if he were a nicer man so it's all moot. The novel is plot driven and it's both well imagined and executed with good pacing and several unexpected twists although it gets slightly clichéd at the end (I'm not going to say how as it would involve spoilers). I like the initial bewilderment of the captives but as the novel progresses they become little more than props to Sheppard's dilemma and angst. There are flashbacks to telling moments in his past which are confusing at first but eventually make sense and illustrate the flaws in his character. A murder puzzle. Three hours or they all die. Six people locked in a hotel room. Morgan Sheppard and five others, Alan, Mandy, Constance, Ryan and a young girl referred to as Headphones. These are all complete strangers to Morgan, the Resident Detective on a popular TV show, yet he has the unenviable task of solving the murder of a dead man in the bathroom before time runs out. It doesn’t take Sheppard long to discover Please see all of my reviews on my blog at https://www.robinlovesreading.com. It doesn’t take Sheppard long to discover that he is the real target. What’s more is that there appears to be no method of escape. Furthermore, if Sheppard does not correctly identify to murderer, the entire hotel is rigged with explosives. The story is told in two time frames, presently as Sheppard must interview each of the five others, and snippets of his past. During these snippets we learn how Sheppard became the man that he is. Everyone has their own suspicions, creating massive distrust and ultimate danger. While I was quite invested in the intrigue that was developed here, unfortunately things became a bit implausible, and this knocked things down for me. I do applaud the creativity that the author employed in this story, so I definitely was eager to identify the killer. If you enjoy Agatha Christie type novels, with edge of a thriller, then Guess Who might just appeal to you.